Scooter on the wall, weekend vibes made perfect! Prominently seen at the famous SDA Market is the branding of Scooter On The Wall which attracted us towards the place on a Friday evening and we immediately made up our mind to visit it! We had to try hard to find the entry because it has a back entry! The moment we saw a scooter cut out, we knew where the entry was from! We started taking the stairs which was through a colorful entry with doors & tyres and led us to a place which was even more colorful with a vibrant surrounding! 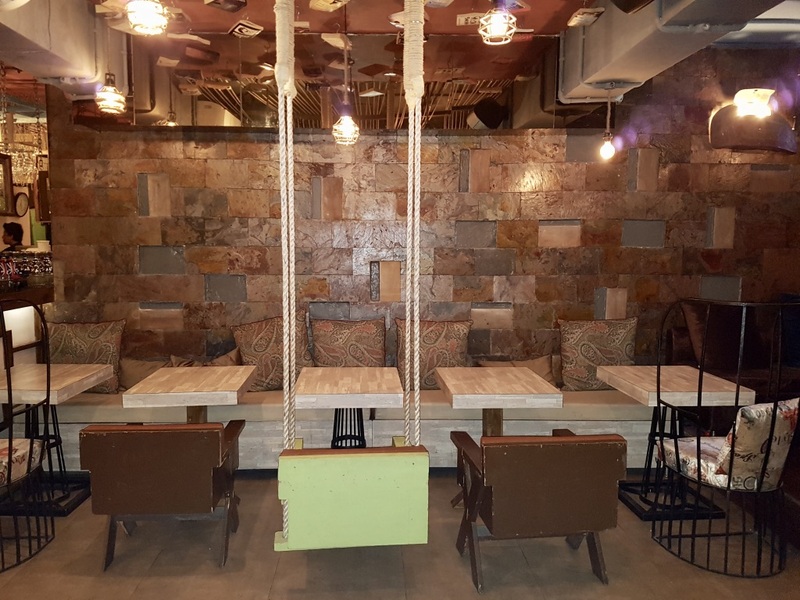 We could swings hanging down through ropes with a wide choice of seating spread across couches with colorful cushions, chairs made of wrought iron and a wall decked up in wooden frames. Ceiling adored ropes as well as antique looking chandeliers. 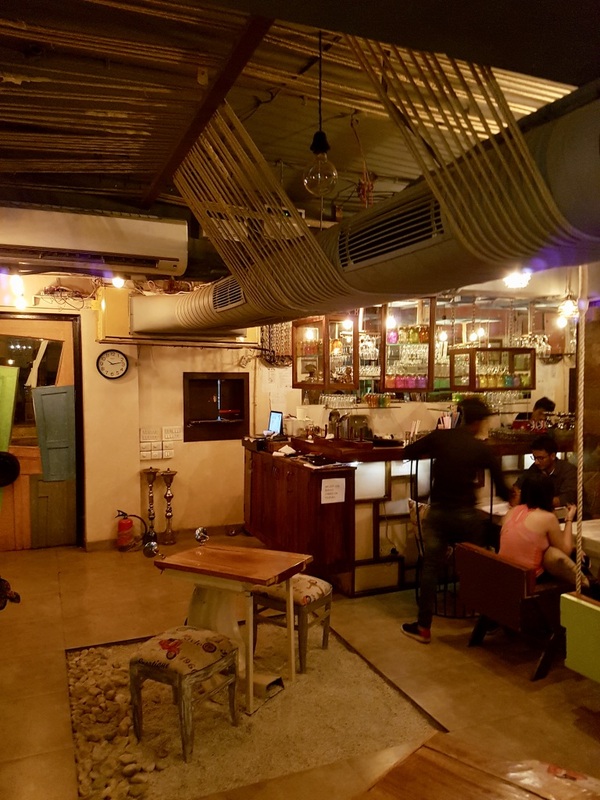 It is a place which would be defined as a perfect hangout for the youth of today. The biggest attraction was the two cute tables in the middle of the 45-seater restaurant which was laid over a bed of pebbles made out of cut scooter! We started with the section called Ignition from where we ordered Chinese Bhel. 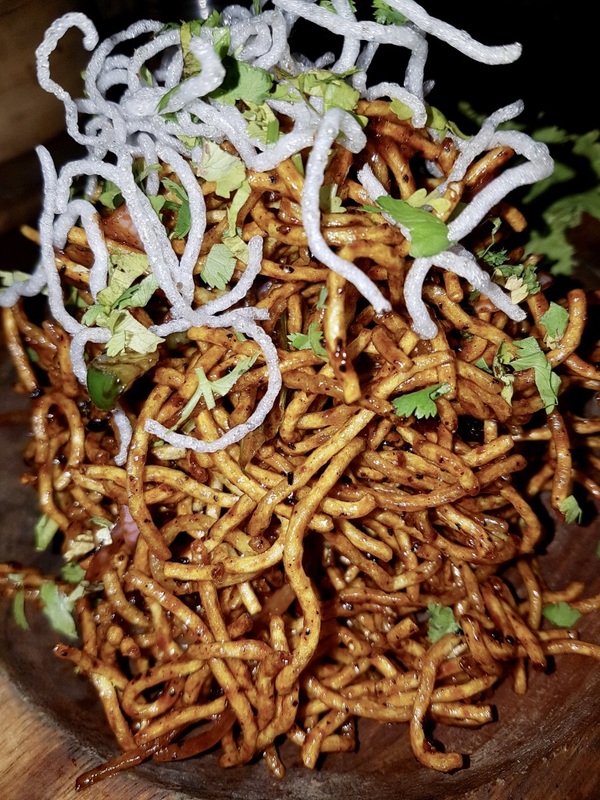 The crispy bhel had a unique flavour which was appetizing and one could keep munching it without feeling full. Displayed in an interesting manner, it was a great start! Jumping on the Kick Start section, we ordered the Butter Chicken Kulcha. Butter chicken is a staple diet for any North Indian and such a fusion attracted me. So without a second thought, I picked up a piece from the platter. 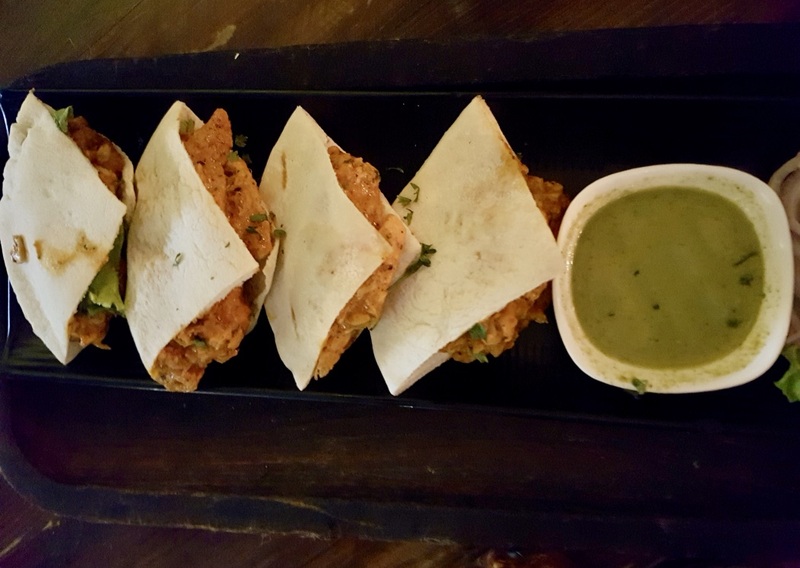 As I took the first bite I could feel the softness of the juicy chicken as well as the kulcha bread which boasted of freshness as well as great taste! Delectable and yum! 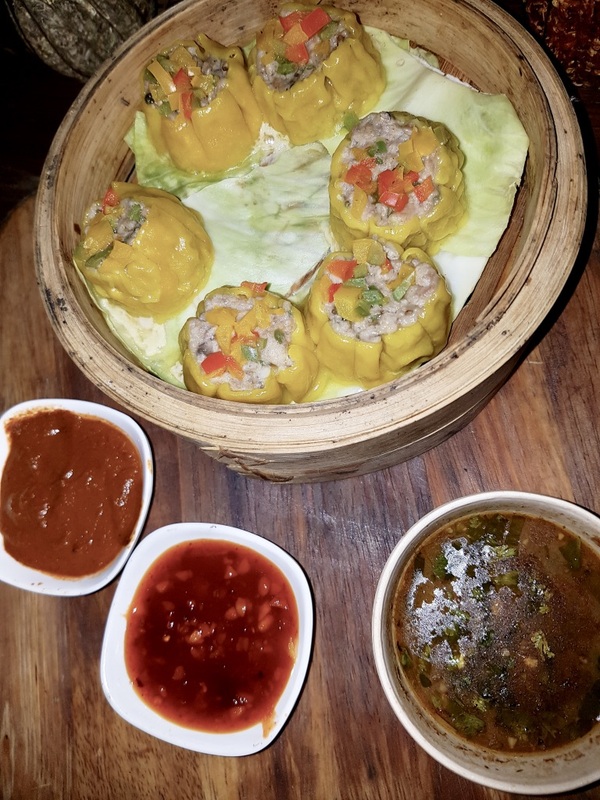 Sui Mai (Chicken) which is an open faced dimsum as described by the server was well-stuffed as well as visually appealing but the taste didn’t delight me as much a dimsum or momo would have delighted. 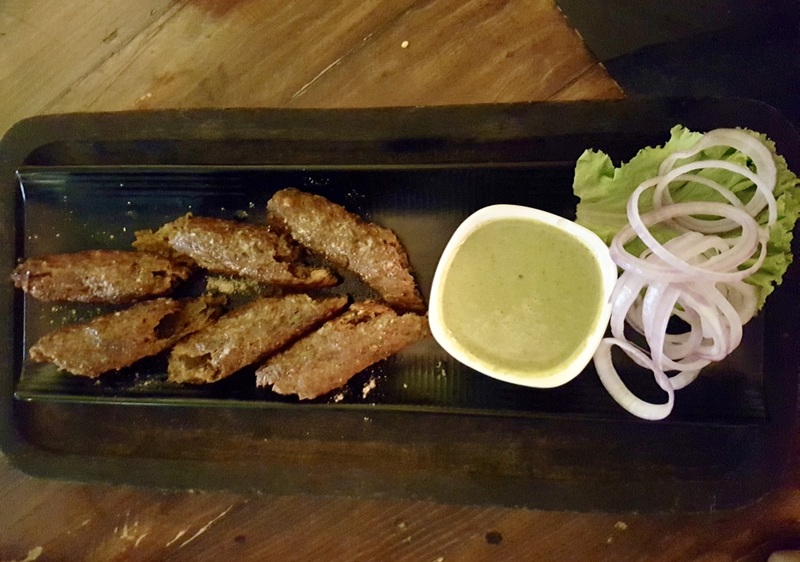 Seekh Kabab (Mutton) from the Tandoori Seat section were flavourful, soft and yum. They were served with sliced onions and pudina chutney over a rectangle tray! 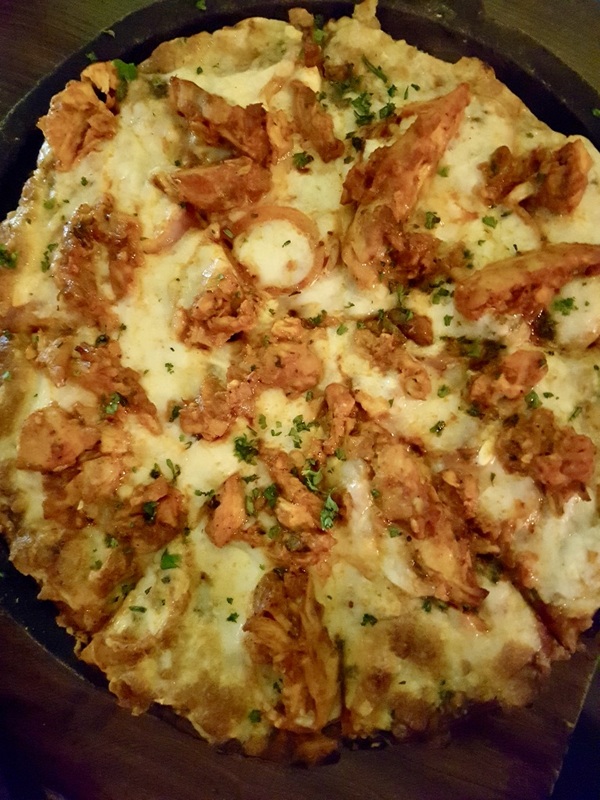 Tandoori Chicken Spicy Onion Pizza from the 9″ Rims section had a perfectly baked pizza topped with mozzarella with fleshy & juicy chicken. It was a little less spicy than expected but Tabasco, chilli flakes and oregano were there for the rescue! To gulp down all we had Cranberry Virgin Mojito from the Mocktail section which was sweet and nice. A different flavour added even more fun to the joy food ride! 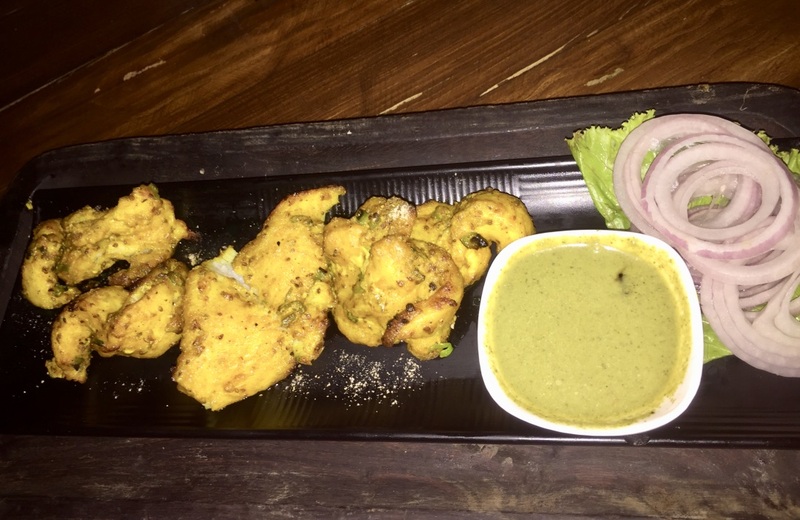 The Ajwaini Fish Tikka from the Tandoor Seat section again was so soft that it melted in the mouth! The Ajwain flavour added the extra spark to the dish which was served with sliced onion and mint chutney. 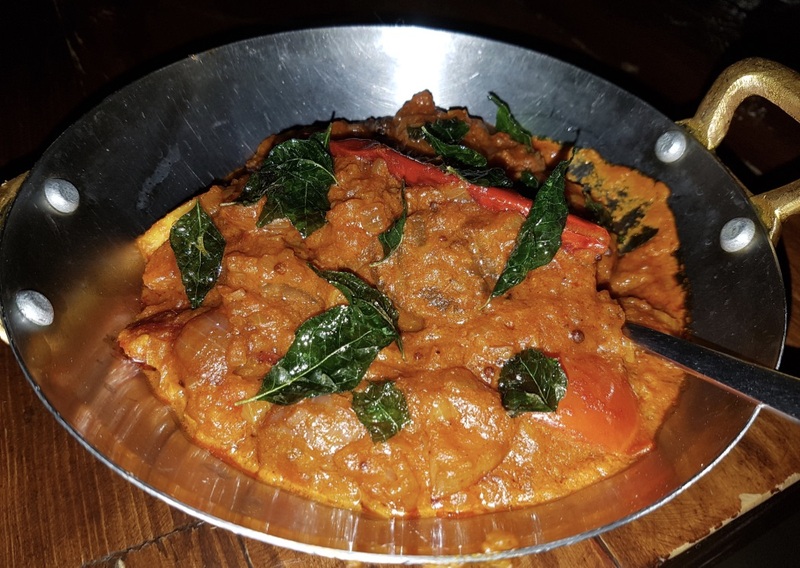 Mutton Maratha was a name that attracted me on the Full Portion Ride section of the menu and we ordered it to beat the curiosity of what it actually was- Boneless pieces of soft mutton cooked in a light gravy of onion and tomato! A relishable dish which we loved! Coming to the breads, we ordered Tandoori Roti, Butter Naan and Keema Naan! 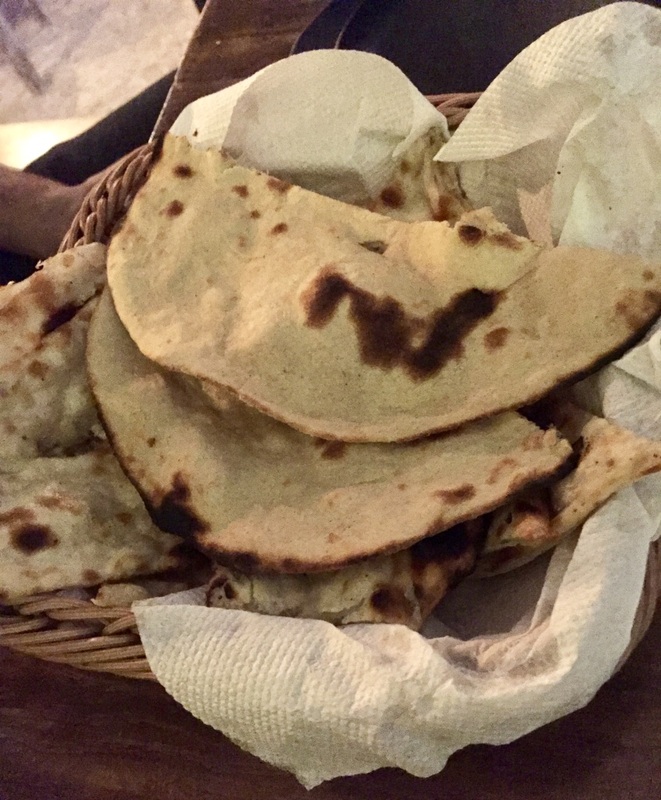 The star was definitely Keema Naan which had a light keema stuffing, while Butter Naan was in its classiest avatar and Tandoori Roti was good but not as comparable to the former two! Coming to my favourite section which is Dessert! 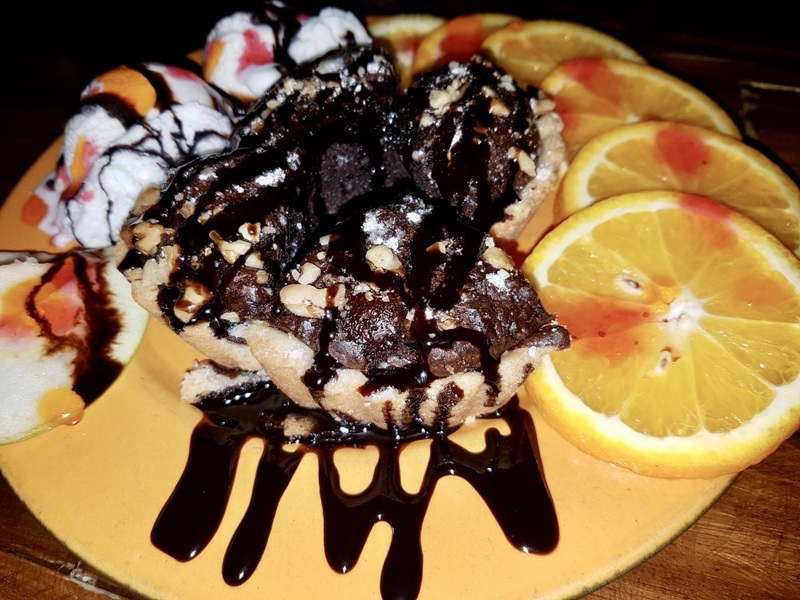 The Chocolate Walnut Pie with Vanilla ice cream was sinfully tempting and I could not wait to delve in it! Super amazing not only in taste but even the presentation! 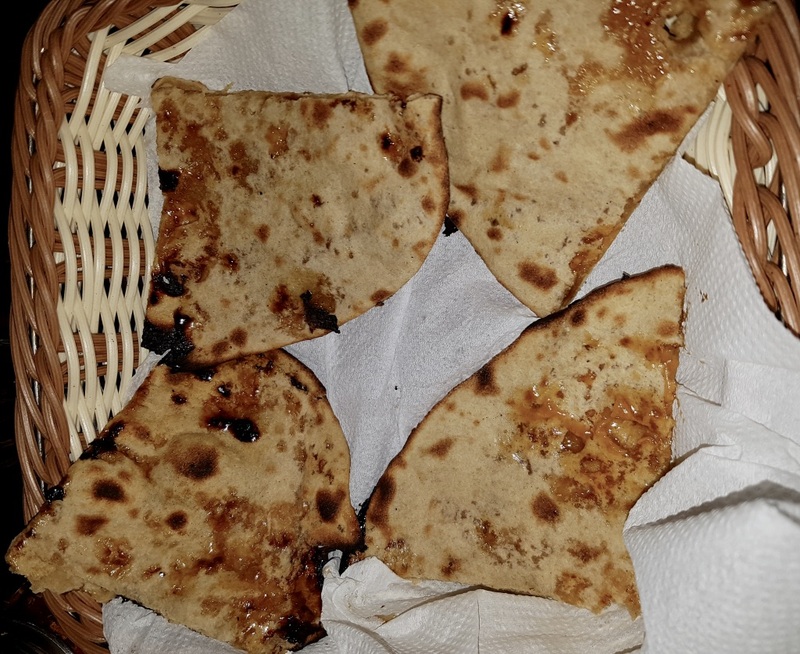 Gur Ka Paratha was again something that we wanted to try because gur is known as a healthy supplement of sugar and when you get to relish it in dessert, it becomes healthy too! Loved this combination! What added more jazz to our fun evening was the light music in the background! Not too loud, not too low, just perfect! One could talk or relax as they get into the weekend mode like us or catch up with friends over gossip! A light-hearted space where we could not just spot Indians but even foreigners as well! The place had just the perfect vibes! Environment and food both are looking good. Will try this Scooter on the Wall soon. Thank you for sharing. 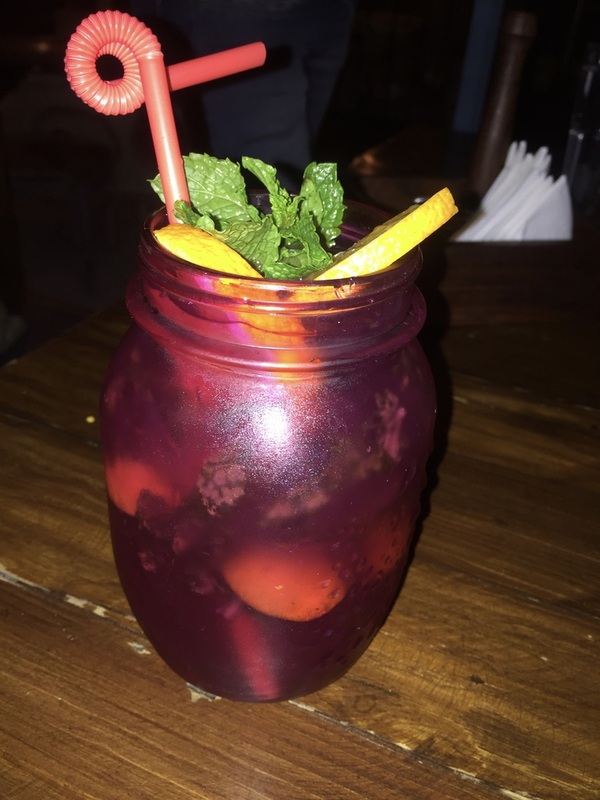 Hi, Shilpa, the blog is really awesome content and Images are really amazing.thanks for sharing with us.